The Russian fascist Rodina (Motherland) party that was founded by Russia’s current Deputy Prime Minister Dmitry Rogozin is organising a large conference titled the “International Russian Conservative Forum” (IRCF) to be held in St. Petersburg on 22 March 2015. I assumed already in September 2013 that Roberto Fiore was building an umbrella organisation that would unite political parties and movements that are generally more extreme than the Alliance of European National Movements. In February 2015, with the creation of the AFP, my assumption has been proven correct. The exact composition of the AFP delegation to the IRCF is unknown at the moment, but the following representatives seem to be confirmed: Nick Griffin, Roberto Fiore of the Forza Nuova, Udo Voigt of the NPD, Eleftherios Sinadinos and George Epitidios of Golden Dawn. The IRCF has almost a year-long history. It was first planned to be held on 15 March 2014, under the name “Russian National Forum against Tolerance”, but due to the annexation of Crimea and the start of the Russian invasion of Ukraine, the organisers decided to postpone the conference to 3-4 October (under the name “Russian National Forum”), then to 7-9 November 2014. Eventually, the organisers settled the final date: 22 March 2015, i.e. only one day instead of 2-3 days that they planned for October and November – this change apparently indicates the organisers failed to invite as many participants as they originally wanted. The prospective participation of the FPÖ in the IRCF raises eyebrows. The FPÖ is clearly on the far right – it is a radical right-wing party – but all the other participants of the IRCF, including the Russian organiser (Rodina) are explicit fascists and neo-Nazis. 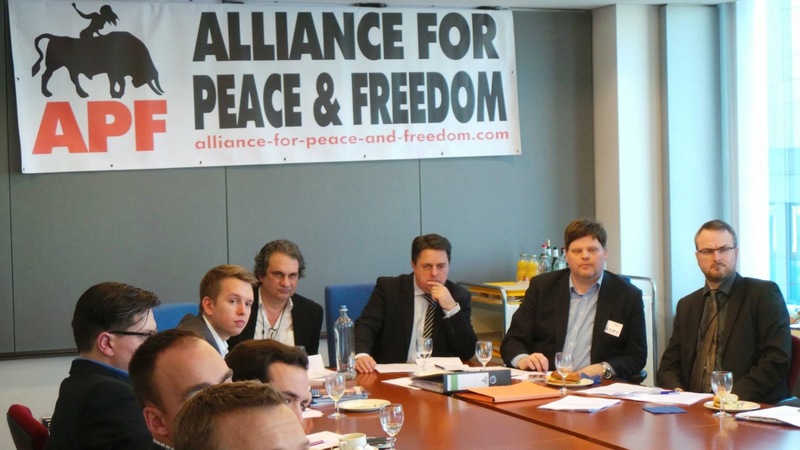 Moreover, a number of European parties eventually refused to take part in this Russian fascist event, in particular the Swiss People’s Party (Switzerland), Scottish National Party (UK), Identitarian Bloc (France), National Front (France), and Jobbik (Hungary). None of these parties wanted to fraternise with the European and Russian fascists. What is behind the FPÖ‘s ideological promiscuity? I believe the answer is clear: the FPÖ is struggling to repeat the “success story” of the French Front National that has secured a multimillion loan from a Russian bank in 2014. To remind the readers, according the available information, these were former leaders of the Rodina party – namely Alexander Babakov and Dmitry Rogozin – who played a significant role in assisting Front National‘s Marine Le Pen in getting that multimillion loan. Hence, if the FPÖ wants the same, it now must obediently stooge for the Rodina party and the Kremlin. High rhetoric about sovereignty? Obviously not when the money is involved! More evidence emerged on Tuesday (10 March) strongly indicating that FPÖ‘s Gudenus had been planning to participate in the IRCF. 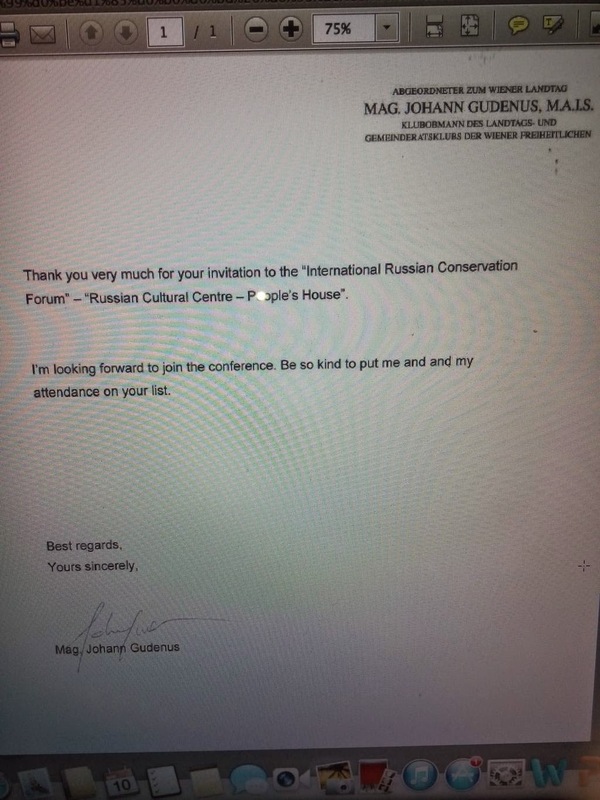 Alexander Fanta, a journalist of Austria Presse Agentur (APA), published a screenshot of Gudenus‘ letter in which the latter thanked for the invitation to the IRCF, said he was “looking forward to join the conference”, and asked to put him and his attendance on the organisers’ list.